Edmund Hollander is President of HOLLANDERdesign|Landscape Architects, one of few landscape architecture firms elected to Architectural Digest’s AD100 Top Designers List. Ed Hollander is on the Dean’s Council and the Advisory Board of the Ian L. McHarg Center for Urbanism and Ecology at the University of Pennsylvania. 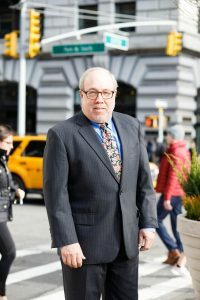 He is a board member of the New York Restoration Project, the nonprofit founded by Bette Midler with a mission to create beautiful, high-quality public space for all New Yorkers. Ed has lectured at the City College of the City University of New York, the Graduate School of Fine Arts at the University of Pennsylvania, the New York Botanical Garden, and other design-focused institutions. He is Past President of the New York Chapter of the American Society of Landscape Architects (ASLA), and is an elected Fellow of the ASLA, one of the society’s highest honors. Ed graduated from Vassar College with a B.A. degree in History, followed by study at the New York Botanical Garden School of Horticulture. He received a master’s degree in Landscape Architecture from the University of Pennsylvania. Soon after, Ed joined The Delta Group in Philadelphia and then the venerable New York firm of Clarke and Rapuano before founding Edmund Hollander Landscape Architects with his partner, Maryanne Connelly, in 1991.